Our address is: 3555 Sunset Office Dr. Suite C-105 St. Louis, MO 63127. 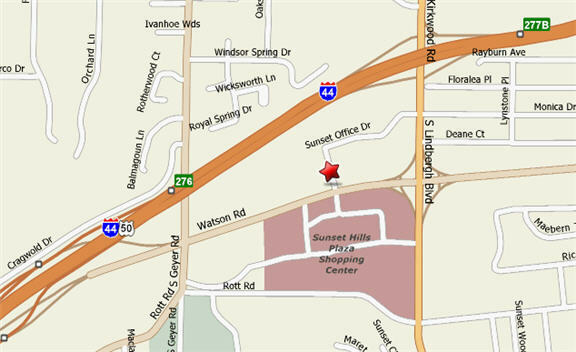 We are located in the Crossroads Medical Building(formerly the Grandel Medical Building) in Sunset Hills, Missouri. You may enter the building from the east, under the awning marked Main Entry-East, then take the elevator to the Courtyard level, suite C-105. Or, for more direct access to our suite, enter from the west side of the building under the awning marked Courtyard-West. You may print out a map using the connection below to Yahoo. If you need further assistance, please call 314-965-3271 for directions. Our doctors are available for emergency care and our phone number is 314-965-3271. If we are in the office, we will see you as soon as possible. If you obtain a recorded message when you contact our office, it will advise you what to do should you have an emergency. If it is a life-threatening emergency proceed to the nearest emergency room as soon as possible. Our doctors are available for out- patient treatment at local surgical centers. We are primarily a speciality practice that enjoys the professional referral from other dental practioners. Many people think that in a busy practice we do not accept new patients or that you must be referred to our office by another dentist. We are glad to see family or friends of yours if you feel that they have similar problems and could use our help.